A woodland plant with attractive foliage. The leaves are wide and often have a dark purplish colour radiating from the center. 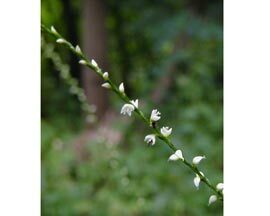 Long slender spikes with tiny white flowers rise two feet or more above the foliage. Reseeds generously, but easy to cull where not wanted because of the shallow root system. An easy to grow with minimum care plant. Long slender spikes are interesting in cut flower arrangements.